If it wasn’t for every article and review written about the Walkabouts in the 90s letting us know “They’re from Seattle but they aren’t really grunge,” the thought would never have occurred, listening to any of their collections of dark country-rock, to connect them to that semi-genre. But that doesn’t mean they’re not connected. 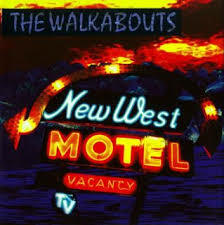 With their use of high-gain distortion and unmuted chords, the Walkabouts on New West Motel have some sonic characteristics in common with the other Seattle bands. It’s in their songwriting that they really set themselves apart, and simultaneously link themselves to one of the precursors of grunge, Neil Young. This isn’t an idle or lazy comparison – the Walkabouts have covered several Young songs (including “On the Beach,” and my own personal favorite song from Tonight’s the Night, “Albuequrque”). New West Motel feels like Tonight’s the Night, but not personal* – the songs are stories, always about desperate people doing desperate things, usually late at night. That’s when the album is best for listening – late at night, driving through hills and past (but never into) cities. These are rural crimes stories, murder ballads. * At least not directly personal. The reviewer has no clue what is personal to the songwriter, and what ain’t, and it don’t matter anyhow – we just listen to the songs. Chris Eckman and Carla Torgenson (the two permanent members of the group) trade off just about every other song. She’s showier, and he sits right into the mix, like he’s another dusty instrument. Works. At a little over an hour, it may be too long. It’s a curse of the CD era (which is over, did you know?) – everyone filled up those discs. That said, I dunno what songs I’d cut. The Neil Young tracks mentioned in the capsule above are on their several b-sides compilations, which are about as good as their regular albums. When did you get this album? Around 1998, when ordering CDs on the Internet first became a thing. I bought this and their other 1993 album, Satisfied Mind, at the same time, largely because Satisfied Mind had a Nick Cave cover on it (“Loom of the Land,” great cover, though I think it’s a little truncated). The Neil Young comparison is apt, though they stick very much on the rockier side of his Rusty sleeplessness’s country-rock. This is the apex, in my opinion, of their pre-European period. Not too much orchestration, a good mix of grindy rockers and ballads, and the great closer. Walkabouts close their albums as well, or better, than most other bands. What instruments do they use? Rock instruments. Electric guitar, bass, drums, some fiddling,and pedal steel.